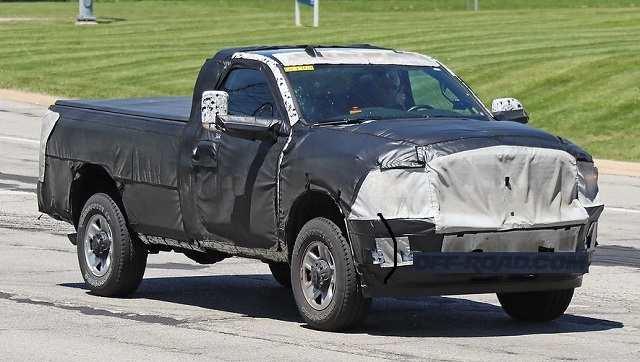 While for the 2019 model year the pickup truck heads were turned toward the redesigned, light-duty models from Ram and General Motors, the 2020 model year will change the course toward the heavy-duty league. Ford recently redesigned its heavy-duty models for the 2017 model year and readying the new round of updates for the next model year. However, Ram and GM will build their heavy-loading pickups from the ground up and bring them as the 2020 models. Ram has done a great job with the all-new, half-ton pickup and it’s not the secret that the new-generation Ram HD models are in the progress. The 2020 Ram 3500 HD has already been spotted on roads covered with the thick camo but already we can draw some conclusions. Based on what we know so far, the story will be familiar and the redesigned Ram 3500 HD and smaller three-quarter-ton version will be built on same principles as the recently redesigned Ram 1500 and that is a good thing. 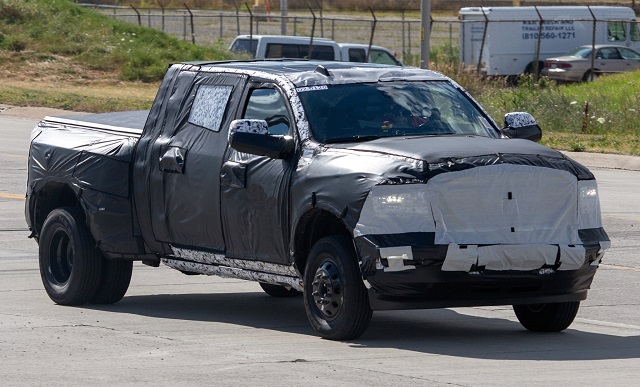 The burly 2020 Ram 3500 HD has been spotted in the different cab and cargo bed configurations while conducting the on-road tests and every time the prototype was covered with the thick camo. Still, it is clear and expected that the Ram HD models will borrow heavily from the new-generation Ram 1500 when we are speaking from the styling perspective. Under the camo, the Ram 3500 HD seems to have the more muscular hood like the new half-ton Ram and it looks also it hides the new grille design. So, Ram HD will also disqualify the four-square, crosshair style and apply the same design language as on the light-duty model. We should also expect the same headlights, bumpers and other styling elements to borrow heavily from the half-ton Ram but all will, of course, be in the upsized form. Ram will also do the similar job on the trucks’ underpinning and use light-weight materials to cut some weight while improving the structural rigidity and capability. The story inside the cabin should be the same as on the all-new Ram 1500. The same styling pieces will appear in the HD models as well and Ram will also improve the material quality and finish while also adding more tech and luxury options. The HD models and 3500 HD version will also benefit from the newest Uconnect infotainment system which will appear in several variants. The system will be available with the navigation or without and with different screen sizes. The massive 12-inch touchscreen will also be in the options list as on the smallest Ram truck. The Ram 3500 HD will also gain the new, advanced safety systems which currently missing from the manual. The truck will again appear in two- and four-door cab style and with the long and short cargo bed. It’s still too early to know details about the powertrains but the 2020 Ram 3500 HD will likely keep the familiar engine options. Still, some reports suggest that a 5.7-liter V-8 might be discontinued. A 6.4-liter Hemi V-8 gasoline engine will be the base engine and power and torque numbers could surpass the current 410 hp and torque of 429 lb-ft. The engine will again be the pair with the six-speed automatic transmission. Ram could also introduce the eTorque mild-hybrid system like in the new light-duty Ram to boost the torque and performance of this engine. The 6.7-liter Cummins six-cylinder diesel engine will get the new chance and provide the best of towing and torque when the Ram 3500 is in the focus. The current most capable version of this engine provides 385 hp and impressive torque of 930 lb-ft. This engine uses the Aisin six-speed automatic gearbox. Ram will surely try to lift the torque and towing ratings to the new limits but we will know details closer to the debut date. With the improved structure, lighter body and probably more inches the new Ram 3500 will be capable to tow more and well over 30k pounds. The off-road-ready version will also be available. The 2020 Ram 3500 HD will likely debut early next year with the on-sale date later in the year. The more capability, tech and sophistication will mean higher price but we will know precise range closer to the arrival.